Caelum was now into the second week of her transformation, and four days into her campaign of kindness towards Magax. 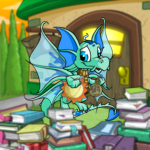 Your petpet is in grave danger! Bravely searching for that one, hard-fought treasure! Or... have we gotten it all wrong?